From the Hancock County Courthouse, go 8.0 miles northwest of Sparta on Hwy 16. You will cross Shoulderbone Creek and pass state highway 77 north. Turn right on Centennial Road and go 2.7 miles to a gate on your right. Walk or drive 0.6 mile to a fork in the road. Take the right fork and go another 150 feet. The cemetery is on your left in the woods. This is a cemetery with 2 rows of depressions and 6 graves set off from the rows but near to them (23 identifiable graves in total). 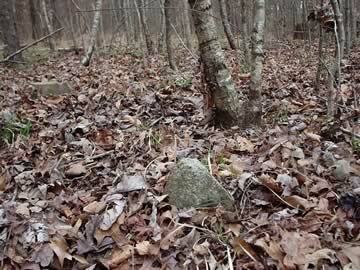 The 6 graves are located at 33 22' 50.1" N 83 04' 58.4" W.
2 rows of depressions with 17 identifiable graves. 5 graves in a row, plus one grave at the top of the end grave, set off from the 2 rows.